Leading Manufacturer of tinned braided copper flexible connector, copper foil connectors, laminated copper foil connector and tinned braided flexible connector from Delhi. 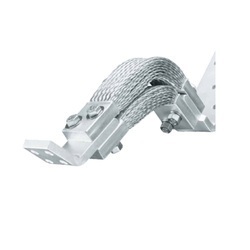 We offer Tinned Braided Copper Flexible Connector and heavy duty busbar flexible connectors are manufactured using multi-layered braids up-by-up as well as side-by-side to increase the current carrying capacity. 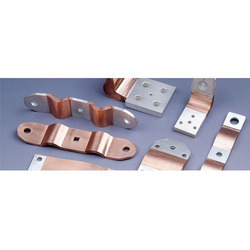 With our efficiency and vast knowledge of the industry, we have come up with a wide array of Copper Foil Connectors. 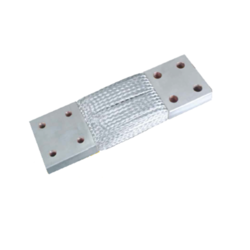 The offered range of product is commonly used as the flexible expansion joints for connecting the bus bars in different applications. Moreover, we are offering these products at leading market price to our patrons. The offered range is highly appreciated and demanded by our valued clients for its desired performance and quality. We introduce ourselves as reputed and trusted the organization to offer a broad array of Laminated Copper Foil Connector. Offered range of connector is designed to take up linear expansion and contraction and compensate for misalignment in applications requiring intentional movement. These connectors are manufactured under the supervision of our vendor's skillful and experienced professionals. These products are suitable for the connection of 4Q2B moving contact terminal, 3Q7B contact terminal, 3Q7B change-over switch contact piece, 4Q51 contactor terminal. To meet the precise demands of our clients, we manufacture, export and supply a qualitative range of Tinned Braided Flexible Connector. Quality checked on prescribed parameters, our Connectors are acclaimed for high quality and durability. These are very safe to use and maintenance free. The key features which make these ahead of our competitors are rust free design, high tensile strength, and long functional life. One can avail these connectors at economic prices.